The interior is certainly a unique sight, but far from the only draw. Sirius has 75 types of tea: exciting flavours of black, green, mate, rooibos, fruity – and even an “I can’t choose!” mystery tea. The wide selection is rounded out by coffees, sandwiches, snacks and the option to rent a hookah. 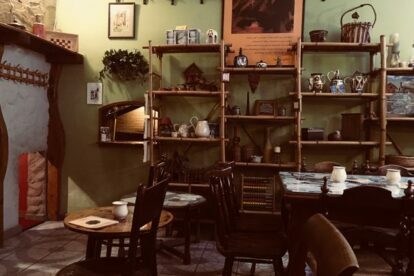 It’s a friendly place with a wonderful vibe, and certainly worth checking out even if you’re not a particularly huge tea fan. Note that the entrance is very unobtrusive, a door leading to the basement level with a small metal sign to its left – you need a sharp eye to spot it!